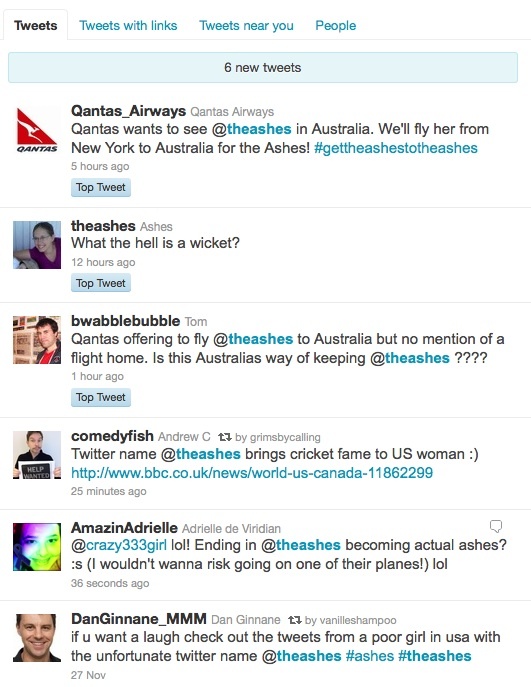 An American teenager who enjoys knitting and the TV show Glee chose, for reasons unknown, the twitter handle @theashes. Unfortunately the ashes are the name given to one of the great sporting contests of all time, no I’m not talking about the world series that only American teams play in, I’m talking about the (sort of) bi-annual cricket series between Australia and England. These two have been playing Test cricket since 1877 however the first match for the ashes was played in 1882. This is not the place to explain cricket! The five match series has just begun with an enthralling 5 day match in Brisbane. Unfortunately for @theashes, fans around the world thought she was the official twitter account and bombarded her for updates from Brisbane! In another tweet, she asked, “what the hell is a wicket?” and later she was unsure whether she should support Australia or England. Enter the Brand. Qantas, sensing an opportunity began a twitter campaign – #gettheashestotheashes and offered her a free flight from New York. Other companies have also offered free tickets to matches, transport in Australia and even mobile phones. She is considering the flight offer, but isn’t keen to travel alone. Qantas has done the right thing, seeing and responding to a great opportunity to develop a brand advocate. It is little events like this that are critical for the successful development of a brand in the social medial space. Now they need to offer another ticket for her to travel with a friend otherwise their initial advantage could evaporate. Although the actual match has little to do with the company (only when they are sponsors, I didn’t check) they managed to become part of the conversation in a very natural way. there. Hi, I think it sounds kinda irrelevant ‘çause as what Dennis said, the actual match has little to do with the company. Personally, I think it might create certain level of awareness but not very helpful. What Qantas did was react to a current development, engage with a consumer in relation to that development and use the opportunity to generate positive discussion about the airline. It was an excellent example of how firms can use current events to their benefit and then have social media spread the word on their behalf. It is to their advantage and is relatively inexpensive. It was a superb example of consumer driven PR. What I haven’t seen is any follow up information on whether the girl has taken up the offer, whether the airline offered a friend a ticket and what the outcome is. Qantas needs to address this in its social media strategy to ensure the momentum is maintained. I think I kinda get your point now. Since it’s not a planned PR trick, I think it would be relatively hard to control and maintain the momentum. Do update us anyway if there’s any follow up.